Star Citizen’s recent Free Fly event was the biggest one Cloud Imperium Games has held to date, giving players the chance to try out more than eighty of the game’s vehicles over the course of a week. And it’s been good for sales: Star Citizen made another $7 million USD over the course of the event. For just about any other crowd-funded project, $7 million would be transformative. But the massively-multiplayer space trading and combat sim had brought in $200 million in crowdfunding by the middle of November this year. Over the course of the nine days since the Free Fly event kicked off, that total has grown to $207,980,408 from a total of 2,182,729 registered users, reports Twinfinite. That’s possibly been helped by a sale on certain backer packages, which is currently running at RSI. They’re offering $10 (£9.60) off the Warbond versions of several anniversary 2018 packages, including the Aurora MR, Avenger Stalker, Reliant Kore, Cutlass Black, and Hornet F7C, among others. That still leaves several of the packages (like the Hornet, Prospector, and Freelancer packs) at more than $100, and it is for a game that’s still in an “alpha” state. Still, the Free Fly event seems to have demonstrated that Star Citizen is getting closer and closer to being a full-fledged game, which is encouraging. It’s certainly come a long way since its 2012 Kickstarter, although perhaps not quite as quickly as early backers might have expected. 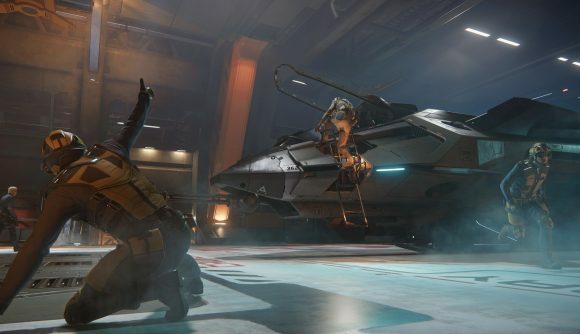 The latest alpha build added Star Citizen’s first major planet, Hurston, which is home to a major trading hub called Lorville. We’re still waiting, of course, for Star Citizen’s standalone FPS campaign Squadron 42, which features a star-studded cast that includes Wing Commander veterans Mark Hamill and John Rhys-Davies, as well as Gillian Anderson and Gary Oldman. For now, we’ll have to content ourselves with discounts on spaceships and that spiffy new CitizenCon trailer.